My very own plot - This time 12A! 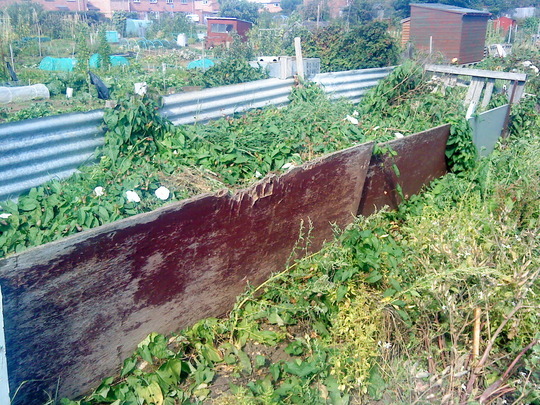 My very own plot – This time 12A! 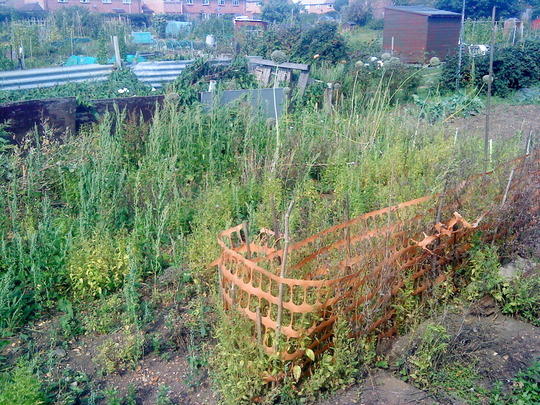 As of 1st September 2011 I’ve become, officially this time, the new tenant of PLOT 12A! Just this morning, 3rd September, the papers came in the post & I’ve filled them out & sent them back to the Town Council offices with a cheque for £12 – the year’s rent till 31st August 2012. I spent a disheartening/discouraging 15 -20 mins walking around them before deciding on one. I’d already turned down two plots on 2 previous occasions this year! I couldn’t go back with a negative the third time! So when I got home I immediately phoned them & told them I was interested in Plot 12A. I was told the paperwork would be put in the post right away. I think I may have found the one with the least work to do on it & which I can make a go of. 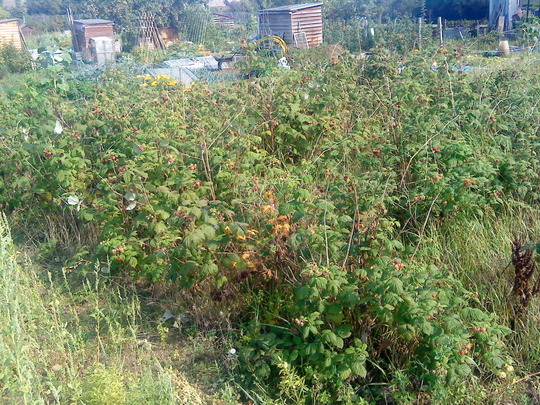 It’s “major” drawback is the out-of-control Raspberry bed, that will need digging out I’m very much afraid! That will be a major job as well! That will have to wait till they die back for the winter. It will probably also be a job over several seasons till I eradicate it all! They make a lot of suckers & the roots can go quite deep & extend a couple of metres to the sides of the bed! I’m not sure whether I’ll keep any plants as yet, I’ll need to examine them closer up to see if it’s worthwhile. It’s not very far from Gerry’s plot either but on the other side of the central path for cars. No doubt Gerry will offer me the continued use of his shed/greenhouse/tools. When I thought I had plot 19A in June he said I could continue to use his things as I have none of my own, well who would need gardening tools on a balcony! Like in June I will continue to help Gerry with his plots, obviously not quite as much but after running 1 & 1/2 plots for almost 2 seasons my own 1/2 plot will seem very small indeed! A couple of more views of the overrun plot I’ve taken on! I gave them a couple of canfuls of water as the soil was so dry. I discover a row of Beetroots & gave them a watering as well after removing the the weeds. Likewise with a row of Carrot seedlings I also found. I also found what look like Spring onions seedlings – I say Spring Onions as you wouldn’t sow normal onions so late in the year. These also got a good soaking! I shall have to empty it & divide it in two only it will have to wait for some time yet as I discovered that there is a wasps nest in it!!! Gerry came down while I was digging a bed alongside the compost heap & brought a load of bags of horse manure in his trailer! He asked me if I wanted them & I accepted so we lugged them out of his trailer & dumped the bags on top of the compost heap for the time being – but away from the nest! Well I shall be posting updates on my new plot in the future though until Spring next year there won’t be much to blog about! I’ll be posting a new blog on Gerry’s plot soon. 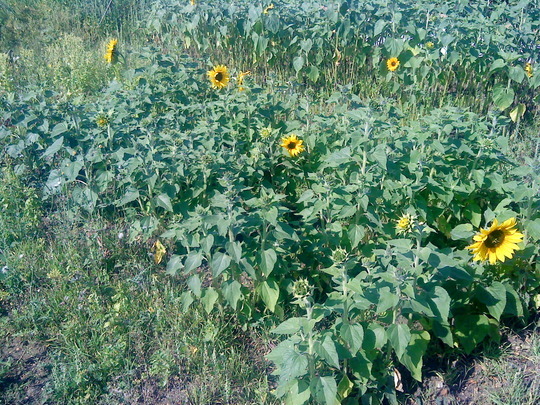 Previous post: Sunflowers, Sunflowers & yet more Sunflowers! Och Balcony! That's just great for you, I'm glad it's near to Gerry's plot too, it's nice to have company sometimes, or a helping hand! Maybe the ground won't be too difficult to dig Balcony, and the weeds and rasps may come out easier than you think? I'll keep my fingers crossed for you! I hope you get some return from your 'rescue watering' it would be nice to bring home some produce grown in your allotment! Good luck with 12A! Lucky you. 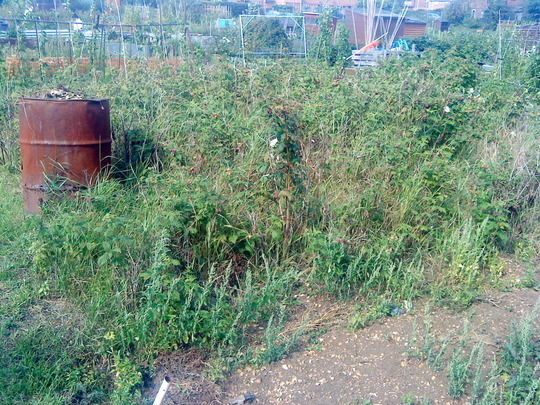 We have turned down a plot as it was right next to the motorway. Too much noise, pollution and dog mess. You have a lot of hard work but I'm sure it will be worth it. How exciting - I look forward to hearing your news and watching your progress over the coming months Balcony. It looks like youre in for a bit of hard work, maybe a small shed would be a good thing to put up quite early so you can have a cuppa and a sit and ponder between digs - I wish you well. 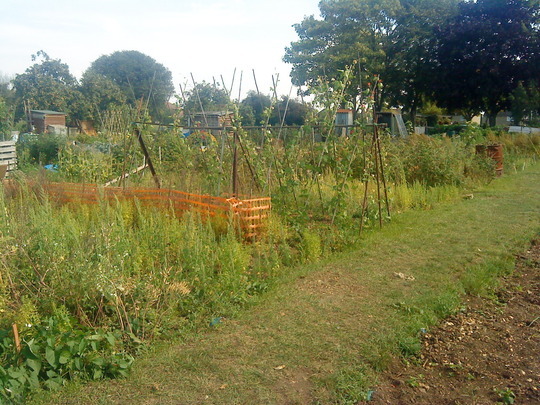 So glad youve got your own plot now... Good luck with all the hard work ahead. Obviously there will be some hard work ahead but, as the growing season is coming to an end & we are preparing for winter with an eye on next spring, there won't be as much as if it were March! I have all winter to "knock" the plot into shape! The hardest work will probably be digging out the majority of the Raspberry canes & preparing that bed for something else next year. I'll be posting the odd blog on this plot till the spring next year when I hope to start off with monthly blogs on my progress - I don't know if it will warrant fortnightly blogs like I've been doing with the plot I've shared with Gerry for the last 2 growing seasons. As I'll continue to help out Gerry I'll still continue to post blogs on what is growing & their progress. I love raspberries. They're my favourite fruits. Shame you're not closer to me as then I'd invite you to come down & fill up a big bag - or two! I've already eaten kilos from Gerry's plots & I've even made up a couple of Raspberry crumbles this week! I've finished one & I'm about half way through the other! Thanks, Joanella:-)) I've been helping Gerry for almost two complete growing seasons now! It was his suggestion last year that I put in for my own plot! But I just love growing plants - be they flower, fruit or vegetable! I'm still on a learning curve with regard to veg & fruit though! As for flowers, well you never stop learning, do you? 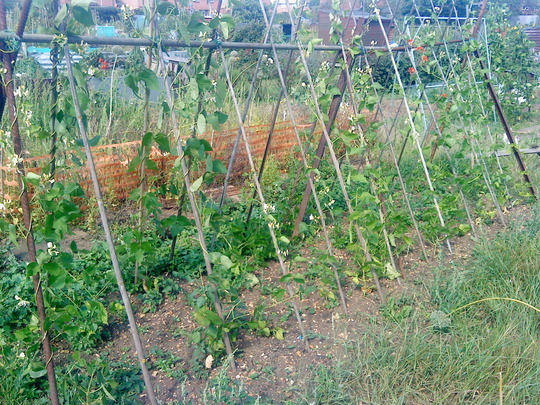 Just looking at the runner beans on my blog & the change that's come over them since I took that photo seems incredible! In fact on Saturday I picked a whole load of beans from them! As my wife & I don't like runner beans I gave them to Gerry's wife at church this morning & she put them on a table & told people to help themselves! 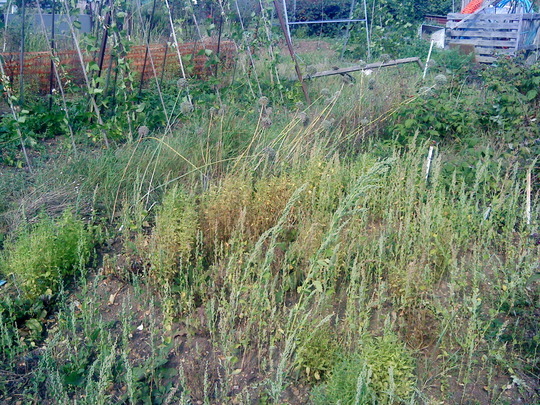 I shan't be growing any on the plot next year. So you also made a Three Sisters' Bed! 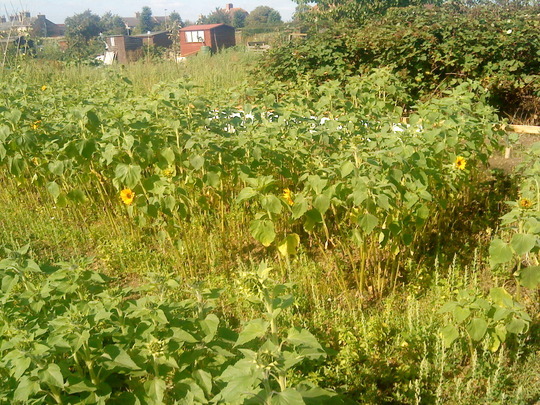 I underplanted our Sweetcorn & Runner beans with Water Melons but they have all died! The beans are giving us lots of pods & the Sweetcorn seems to be doing well. Not picked any cobs as yet though! I must check them out tomorrow before I forget!!! I have to pick any beans that there might be left on the plants for the Harvest Thanksgiving Service we have at our church this Sunday.